The Used will hit the road again on a headlining tour in support of last summer's 'Artwork,' with Chiodos -- who aren't far removed from our exclusive video interview series -- riding sidecar! The tour begins in Las Vegas on March 27 and includes a stop at Dallas' MusInk Festival on April 11. The tour wraps in Porland, Ore. on May 2. 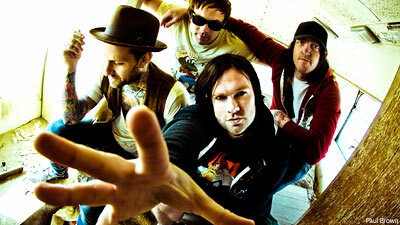 Chiodos will serve as main support, with New Medicine appearing on the final few dates, replacing Chiodos. In other Used news -- we know, that rhymes -- the band released two iTunes-only EPs for $1.99 each. 'The Bird and the Worm' EP features an instrumental version of the song that is featured in the trailer for the blockbuster-to-be 'Clash of the Titans,' while the other EP, simply titled 'B-Side Untitled' EP, hosts two B-sides from 'Artwork.' So there's a whole lotta Used going on.